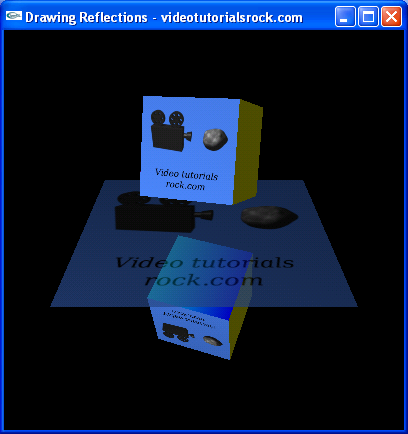 The basic idea behind making reflections is to draw the object or objects that you want to be reflected across the surface, then to draw a second, reflected copy of the objects. Then, you can use alpha blending to blend the reflective surface onto the screen. So let's do that. Let's take the cube from this lesson, draw two copies of it, and blend a floor to the screen. Oops. Our cube has "leaked" off of the reflective surface. We're actually going to need to understand a new concept: the stencil buffer. It's that time again: time to run through the code. We have some constants, explained by their comments. We have drawCube and drawFloor functions. I'm sure you can guess what they do. We have a little something new at the top of drawScene. In addition to GL_COLOR_BUFFER_BIT and GL_DEPTH_BUFFER_BIT, we're adding GL_STENCIL_BUFFER_BIT to the call to glClear. This makes it so that we clear the stencil buffer, so every pixel in the stencil buffer is equal to 0. With this code, we draw the normal copy of the cube. In this section of code, we're going to set every pixel covered by the floor to be 1 in the stencil buffer. First, we enable GL_STENCIL_TEST to indicate that we want to start using the stencil buffer. Then, we call glColorMask(0, 0, 0, 0) to disable drawing to the screen. Right now, we only want to draw to the stencil buffer, not to the screen. Then, we disable GL_DEPTH_TEST, since we don't need depth testing, in order to speed things up a little. There are actually lots of interesting things you can do with stencil buffers, but I'll only explain what we need to know for reflections. The call to glStencilFunc(GL_ALWAYS, 1, 1) makes it so that the stencil test always passes. I'll explain a little about the stencil test later. Then, we call glStencilOp(GL_KEEP, GL_KEEP, GL_REPLACE), which makes it so that every pixel where we draw will be set to 1 in the stencil buffer. As a result, the subsequent call to drawFloor has the effect of setting every pixel that the floor occupies to be 1 in the stencil buffer. And now, we're all set. The stencil buffer is 1 where the floor is and 0 everywhere else. Now, we need to draw the reflected copy of the cube. We call glColorMask(1, 1, 1, 1) to re-enable drawing to the screen, since we actually want the reflection to show up on the screen. We also re-enable depth testing. We call glStencilFunc(GL_EQUAL, 1, 1), which makes it so that the stencil test only passes at pixels where the stencil buffer is 1. OpenGL will only draw the reflection where this test passes. Then, we call glStencilOp(GL_KEEP, GL_KEEP, GL_KEEP), which makes it so that we won't alter the stencil buffer while drawing the reflection. 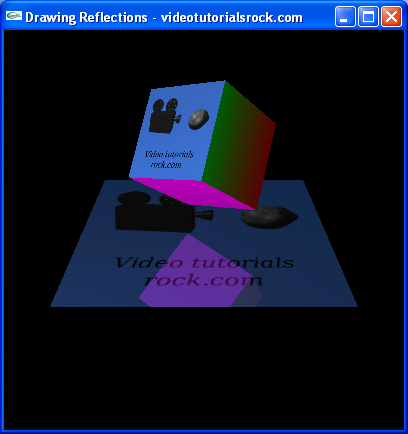 Then, we actually draw the reflection, using a call to drawCube. We disable stencil testing now that we're done with the stencil buffer. Then, we blend the floor onto the screen, using an opacity of 70%. And we're done. We've successfully fixed reflection, so that the floor appears to be a reflective surface.